vincent_admin September 24, 2018 September 24, 2018 Comments Off on Why do so many millennial brands think adults want stickers? Glossier, Milk Makeup, Outdoor Voices, and more are giving out sticker sheets as freebies — and free advertising. Welcome to Noticed, The Goods’ design trend column. You know that thing you’ve been seeing all over the place? Allow us to explain it. What it is: Individual stickers and sticker sheets that aesthetically call to mind your middle school trapper keeper. These usually feature company logos, catchphrases, hashtags, and on-brand images. Where it is: In the packaging of e-commerce shipments for brands like Ouai, Glossier, Brandy Melville, Hero Cosmetics, Outdoor Voices, Milk Makeup, and Dripkit. Companies have also been handing out stickers as their primary marketing material at influencer events and product launches. When talking about the sticker trend, it’s impossible to ignore the critical role of millennial beauty darling Glossier, which includes a sheet chock full of on-brand iconography (smiley faces, its own logo written in loopy letters, cherries, and stars) inside every order. Glossier also ships many of its products with limited edition seasonal logo stickers and an especially popular scented sticker to promote the launch of its first fragrance, evoking the powerful nostalgia of scratch-and-sniff. Other players in the beauty space, like LA-based celebrity stylist Jen Atkin’s hair care line, Ouai, have taken to tailoring sticker sheets to coordinate to specific product launches, like their new back-to-school kit, which comes with a branded sticker sheet full of palm trees, ice cream cones, cherries (again), and cheeky phrases like “OUAI woke” and “Goal Digger”. Hannah Beals, director of marketing for Ouai, says that her team has been pleasantly surprised by the amount of DMs they’ve received from consumers who want the stickers to be included in all web orders, not just in product launches or at events. “We know our community likes to customize their hair and skincare routines, so we thought the stickers would just be a nice add-on. For example, we’ve learned that our girls like dogs, so we created a dog sticker,” she says. Why you’re seeing it everywhere: The trend’s success is all about recognizing and playing the nostalgia card with millennials, most of whom grew up meticulously decorating their caboodles in the golden age of stickers from Lisa Frank and Happy Bunny. For Hero Cosmetics, the company behind cult-favorite Mighty Patch, the decision to include stickers that say “Be Mighty” with the earliest shipments of their e-commerce acne patch orders has a lot to do with how CEO and co-founder Ju Rhyu wanted consumers to feel when they used a product designed for an unsexy reason. “Since pimple emergencies can make people feel insecure or desperate, we wanted our sticker to remind our customers that they can feel confident and secure even while struggling with breakouts,” she says. Unsurprisingly, Instagram has become the most popular way for millennials and Gen Z shoppers to share photos of which brands they support. “Our stickers were so popular with our community [that] we jumped at the chance to add them to Instagram when the feature launched. Now we see everyone use them when they tag us in their Stories,” says Beals, referring to one of the app’s newest features that essentially digitizes the success of physical stickers. 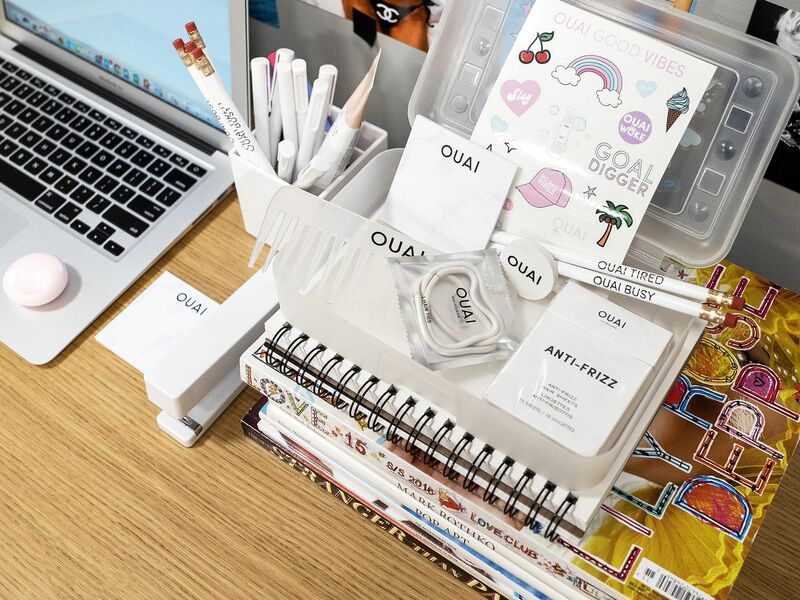 Beals says that many of Ouai’s stickers aren’t even explicitly branded, because the emphasis is on creating chic sticker sheets with fun icons that customers actively want to put on their personal belongings. In other words, brands have figured out that no one wants to feel like a walking unpaid billboard (unless, of course, the brand is Supreme). For example, Milk Makeup’s stickers include phrases like “Preach”, “Slayer”, and “Vibes” with the brand’s website written in de-emphasized text on the side, or not included at all. Outdoor Voices includes its mantra #DoingThings in white lettering on bold navy stickers (perfectly sized to wrap around a Nalgene), while coffee company Dripkit includes a sheet of caffeine-themed stickers (easy to customize a to-go mug with) in every mailed order. Likewise, Brandy Melville, the tween brand best known for its frustrating “one-size-fits-most” policy, includes loosely branded stickers in its orders — there’s even an item in the company’s FAQs about how to get a hold of more of the free stickers shipped with online orders. Ultimately, companies are eager to lean into stickers as a marketing tool because of the creative agency and opportunity customers have to turn literally anything they own — from phone cases to lighters to water bottles — into a branded item they’re excited about.